For some of us, when we hear this word, we brush our hands to the side and think it is not important. For some of us, we might think this is a foreign concept not one that we empower or understand. This week, during a private horse retreat I led out of our beautiful retreat center, a man---coach, leader, TED talk speaker---came and spend 3 days with us. 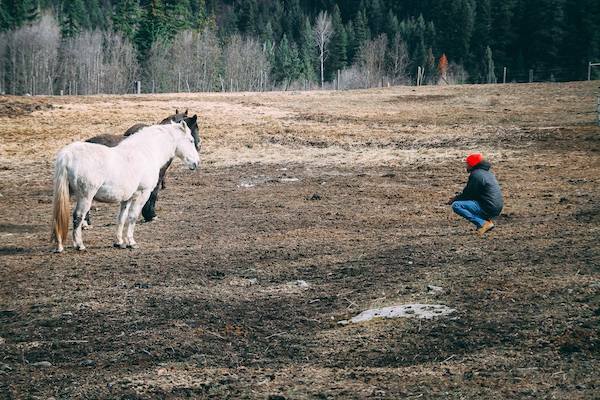 He was seeking clarity on his purpose, a quest for a vision, a call to be with horses. He was not a horse man. He didn’t grow up with horses. He was a man seeking clarity and his intuition said to come here. Often what happens in these retreats is that people come with one agenda and another one emerges. For this man, from the first day what became a theme was the theme of self care. When we don’t recharge ourselves, we run on exhaust fumes. We are constantly depleted, unable to give to ourselves, our dreams, our responsibilities, our businesses and our families. We are not in service of anything in these places. The horses mirrored for this man during his retreat the essence of care. The herd lay down, stood silently, and created a space for him to recharge. Horses understand the necessity for self care and the indulgence of listening to when we need rest, or to eat, or to pause. As prey animals, if they do not tend to their energy, they will not have anything left if a predator comes by. For them, it is essential to their survival. It is for us as well. Stress, depression, exhaustion, worry are all and can be parts of our daily lives that we have come to simply just accept as part of life. But we don’t have to do that, and truthfully, it doesn’t serve us when we do. We spoke about how to integrate this into his life. He shared with me that he realized this retreat was for this purpose, to have space, time to care for himself. Until he created space to tend to his needs, nourish his body, mind and soul, the clarity he was seeking couldn’t come to him. Self care is not a frivolous act. It is not something we cannot afford. Self care is an essential ingredient to our well being, worthy of being listened to and being integrated into our lives. Self care promotes wellness. It gives us energy; it recharges us. Self care needs to be a part of our day and tended to. It needs to meet our needs holistically, from our spirit to our body. There is a great article on Psychology Today that gives ideas to ways we can hold our self care as an example. The Chopra Center also wrote a great article breaking down all elements of self care you can read below. What I find important is for us to listen to what self care looks like to us, to be fluid with it, taking time to ask how it wants to be held instead of assuming, or imposing what it is. For me, self care is a way of being. It is a mindful way of being in relationship with my whole self. It is listening to my body needs, to my mind, emotions and to my spirit, having daily check ins, listening to my rhythms, creating space for all pieces of myself to be tended to. I asked this man on his last day to sit with how it was going to look like to integrate self care into his world, and to remember the purpose behind it. It is our mind and our beliefs that keep us from tending to ourselves, telling us stories that we don’t have time, or we can't afford it or that it will take away from our responsibilities. But we have to challenge those beliefs because they are simply not true. Self care empowers your process. It allows you to have energy for your responsibilities. It doesn’t have to take all day; it can be intermittent moments that blend in your day, 10 minutes. But we have to realize that we can’t afford not to. I encourage anyone who is reading this to really listen to where this is hitting home. Depletion, hustle, being unwell is not a badge of honor we can afford to wear. Listen to what you are being asked to hold for yourself and make it priority. A simple shift in how we hold ourselves and our care can go a long way. And if you are curious to hear about this man’s account of his time here, you can watch his testimonial below, and also get to meet our dog, Luca who inserted himself into this video. If this resonates for you, feel free to share it, or comment. I love hearing from our community. I am starting a new series on our blog post and youtube channel sharing the wisdom of the herd. 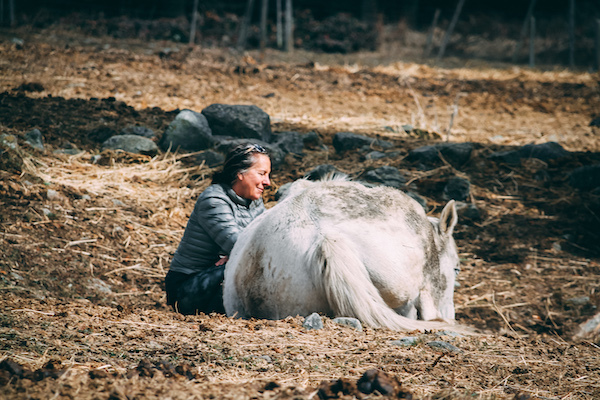 Over the last 12 years of me facilitating in the realm of equine guided coaching and running horse medicine retreats for my clients, I gained some incredible wisdom that has positively impacted my life and those of my clients. I want to bring these teachings out into the world more deeply and so this series began. This week, I hosted a women’s business empowerment retreat for women entrepreneurs at my retreat center and facilitated an equine guided coaching experience with them. The theme that emerged for them (and for me as well) was the theme of efficiency. As prey animals, horses are highly efficient with their energy output and consumption. They have to be---for survival. In nature, it will not serve a horse well to have a lower energy reserve because they have to make sure they are able to flee when a predator comes. Even though horses are domesticated, they still operate with this prey survival mode. As human beings, we are not super-efficient with our energy output. We are constantly leaking our energy on future worries or fears, holding onto the past, or feeding assumptions that we build in our minds. We struggle with stress, burn out, and fatigue because we have not learned how to be efficient with our energy. What I have learned from horses and from the wisdom which came through this weekend for these women is how important it is for us to be conscious of how we are utilizing and wasting our energy. When we are holding space for big things, or even just navigating through life, our energy is essential to being able to put action, focus and direction into achieving our goals, or simply just living a life that isn’t filled with stress and fatigue. As an entrepreneur myself, and having a full life, I have had to learn this lesson the hard way. I had to understand that efficiency is something that is deeply important to my own personal well being and that of my business. Think about this for a second... How much energy do you consume on your stress? Worry? And on fears of something that hasn’t happened yet, or happened in the past? Do you notice yourself experiencing dips in your energy level, or flirting with the edges of burn out on a constant level? Does stress impact your health? Do you find you have less time to enjoy your life? Foggy mind? Frustration or short temper in communication? Do you avoid conflict, and then, stress about it? Do you feel as if you are constantly running on empty or low fumes? Never able to fill up the way you need to? All of these are symptoms of lack of efficiency in our energy, or knowing how to be sacred keepers of our focus. It is just as detrimental to our survival to not be efficient in our own output of energy. We may not be prey animals who have to think about having energy to flee, but we do need to be at an optimal level to achieve what we desire in our lives without burning ourselves out and sacrificing our happiness. So how do we become more efficient and pull this lesson forward in our lives? For the women this weekend, we spoke about listening to when we feel we need to rest. It is really easy for us as entrepreneurs to get into this hustle mode where we think we have to work all the time to get ahead. Our brain and our operating systems that we have been raised in will push us in this way, telling us that the only way to get what we desire is to work really hard and sacrifice ourselves. But this way of being is not actually efficient, or productive to achieving the level of success we seek. When we are depleted and running on empty, we really don’t have the capacity to create what we need, serve our clients, our business, our family, or ourselves. To be efficient, we need to pay attention to our rhythms, to listen to when we feel we need to eat, rest, and create. All aspects of this process are important to honor because this is what fills our tank. It is not lazy to rest. It is serving to your energy and efficiency to do so. In my own journey, I have also fallen into the trap of work harder, and push myself, and that almost killed me, literally. It took me getting trampled by one of my horses to snap out of it, and listen to where I was abandoning my own needs for self care and rest. Now I pay attention. When my body is telling me to rest, I take a break. I have created my days in a way that serves my most optimal and efficient energy output. I understand what it looks like in my own rhythms of when I am most productive and when I need to break. Eating when I feel hungry (and knowing how to recognize it), drinking enough water and giving my physical self what it needs is super important. On a mental level, I have created boundaries around how long I allow myself to stress or worry about something. I don’t think it is realistic for us to not worry or stress at all, but we need to be mindful of how much time is spent here. For example, if something is stressing me out, or I need to have a little worry session, I put a time limit on it. This looks like for me saying, Ok, for 30 minutes you can stress about this and then you need to let it go. I also look at what is causing the stress and what is going to relieve it. Is it delegating the issue to my staff, recognizing that it is an issue that is better suited to their zone of genius? I will tell you as a leader of a business the importance of delegating and letting go of tasks that create stress for me has been essential. Holding a practice of mindfulness so that I am aware of my thoughts is also key because we lose so much energy on the thoughts we feed in our minds all the time. Developing a practice where you are tending to your mental mind is key to a more efficient use of your energy. What often happens when we get really busy, or we are full in our lives, is we bypass our emotions. I am guilty of this one as well. There is a lot of energy that gets wasted and consumed on our emotions that go left untouched or ignored that depletes us. I have created a practice in my life where I check in with myself at the end of the day. How am I really feeling? Did something happen today that bothered me? The first 3 years after I bought this ranch, I was in survival mode. I created no space for myself to feel. I was on autopilot. I was also exhausted a lot of the time and was bypassing my emotions all over the place. I didn’t always realize what a toll building and sustaining my vision, and things that were happening in my day-to-day where having on me. I didn’t think it was important for me to sit with what was happening, and it caught up with me. We don’t often appreciate our sensitivity, or how things impact us until it shows up in a health crisis or breakdown. If we create time in our day each day to do a simple check in, to have someone we can talk to if we need it, we'll save ourselves a lot of energy and grief in the long run. If you are a coach or a facilitator... we don’t always appreciate what we carry for our clients as well. Checking in to clear ourselves of holding energy that doesn’t belong to us is also an important aspect of tending to our emotional efficiency. (I spoke to this on another video you can check that out here). Efficiency is a way of living and it is a practice. I have learned, though, what helps me to be devoted to some of the practices I spoke to up there is to understand the impact on me if I don’t do it. Click here to read another perspective on Why Rest is the Secret to Entrepreneurial Success. Our efficiency is going to support our ability to be able to hold space for all of this and ourselves. I created my success through burnout only to understand that wasn’t really success. I was unhappy, stressed out with little time in my life to devote to my own health and relationships. It didn’t align to my values of how I wanted to live. Taking this lesson to heart has created more spaciousness for me, intuitive creating that empowers my natural way of being in the world, and time for relationships, friends and family that are deeply important to me. I am also just a happier human, as will you be. Efficiency is a powerful teaching gathered from the herd which also has deep application to our own operating systems as human beings. For my women entrepreneurs who resonate with this post and are interested in experiencing horse wisdom for yourself, check out our horse wisdom for Business Mastery Retreat happening in June. Click the link below for more information. I was 29 years old when I embarked on the journey of becoming an entrepreneur. It wasn’t driven by a desire to be in business; rather it was driven by a deeper pull of holding purpose in my world and creating something around my love of horses and the knowing I had of the wisdom they had to share in the world. No one really can prepare you for the journey of being an entrepreneur. The ups and the downs, the rejection and the heartbreak, the sheer force it takes to continue each day to battle against the fears and the doubts that come along with beginning something that is yours to create. I was naive when I began, unprepared for what would be asked of me, what it took. I knew nothing about running a business, marketing, creating a service around what I did. I was terrified, filled with doubt and lost in my own fears. Over the last 7 years, my business has grown. I went from leasing a facility to buying an 80 acre ranch, to struggling with my business and running into debt, to generating 6 figures in three branches of my business. I have watched my own vision deepen in the world, the impact of my work deepen, and my success continue to rise each year. There are many formulas, secrets and keys people share about creating success. If I have learned anything over the last 7 years, it is that there isn’t a formula. It is not always about understanding the logistics or practicalities of running a business, but rather the journey we take inward to find the courage for us to pursue the things that call to us. The majority of my success I believe lies in my capacity to travel inwards and hold space for my visions, to be confident in what I create and to know with certainty the clarity of the message and mission I bring to the world. 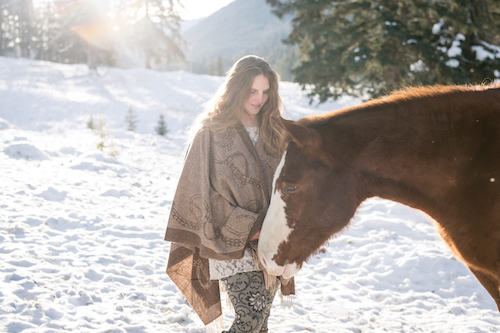 For me, my horses have been not only what I create around, but my own lifeline of connecting to my courage and inner compass that guided me along the way. One of the greatest challenges I believe we take as entrepreneurs is moving through our own doubts and fears, which often paralyze us and prevent us from taking action, being courageous and listening to our own guidance when it comes to knowing the how’s. In my greatest moments of uncertainty, when I have not been able to find my way forward, or I get lost in my own fears, I find myself walking into my herd looking for a different anchor, a knowing that feels elusive to me and a courage that allows me to continue to pursue my path and stay the course of building my business around my work. Three winters ago, during one of the hardest years of my journey, I found myself out in the field with the herd looking for answers. I was doubting myself. I was scared, uncertain that I would be able to support this new evolution of my journey in my business with a retreat center, bigger bills to pay, all on a single income. I went to the horses to find some place of clarity and strength within me and I sat against a tree. One of my horses, Chief, who is the lead gelding came over to stand behind me. His presence alone with his strength and certainty seemed to permeate over to me. In that moment I could feel his support, a reminder that I wasn’t on this path alone and what I needed to access within myself was the trust in my own vision and leadership. When we are building something, it is hard to trust our instincts, especially when we are inundated by advice that seems to fill our news feeds and come at us from multiple pathways. People in our lives give us advice or fill us with doubts, and we can begin to doubt ourselves and wonder what we are doing. It takes us off course and fills us with fear. It is hard amidst that to find our own voice and to trust it. As I sat in the snow against a tree with Chief at my back, I got access to a part of me that had been elusive. The part of me that trusted I would be able to see this through, that trusted my own instincts, that I was supported in what felt like an insurmountable task at hand suddenly emerged in these precious moments with Chief. Just being around this horse, in his leadership and his knowing, his presence behind me was enough for me to find that space within myself. This is what I have always found so powerful about the medicine of horses, the palpability of the energy that emerges from them. In the space I co-create with my herd there is a deeper space of presence of which horse emerges for us and what is significant about that. Chief, being the leader of the herd, in his quiet presence and powerful knowing was exactly what I needed in that moment to feel the part of me he mirrored. His strength and his presence gave me the ability tap into that part of me, to continue in the persistence of what was before me, and in a way that didn’t feel disconnected to my own leadership. The space horses open up for me and for those that travel here is powerful. The success of my business has been built upon the ability of me to navigate for the most part the places I hold myself back, get lost in my own fears, and move beyond my doubts. When we are building something, it is important for us to have confidence, to trust our intuition, to know the clarity of our mission and vision of what we are building and understand the best course of action that will play to our strengths. When we walk into the space with horses, we are getting access to parts of us that sometimes go hidden in the worries we carry. We get mirrored in our clarity and find certainty in their reflections. This gives us the strength to keep moving, to keep building, to clear out the clutter in our minds and know for certain what, where and how we will continue to grow and pursue what is ours to create. What has been inspired by my own journey and through what I have supported hundreds of women over the last 7 years is a retreat that is dedicated to empowering women who are feeling stuck and held back by their own fears and uncertainty when it comes to navigating the journey of entrepreneurship. 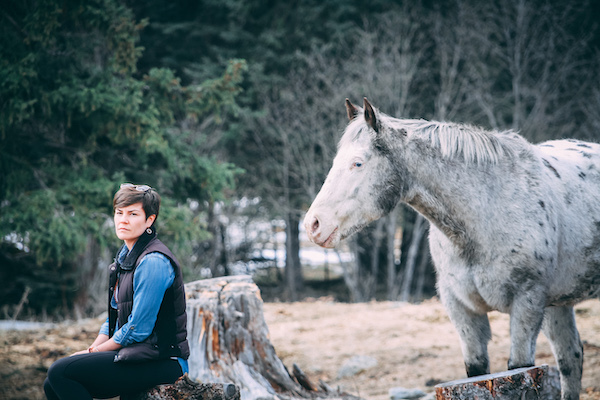 Horse Wisdom for Business Mastery is a 5 day retreat for women that are feeling stuck in their business, vision and belief in their ability to create their success around their purpose and calling in their work. It is a deep dive into our internal world, looking at our places of fear that hold us back while achieving support in the external pieces of our business as well. 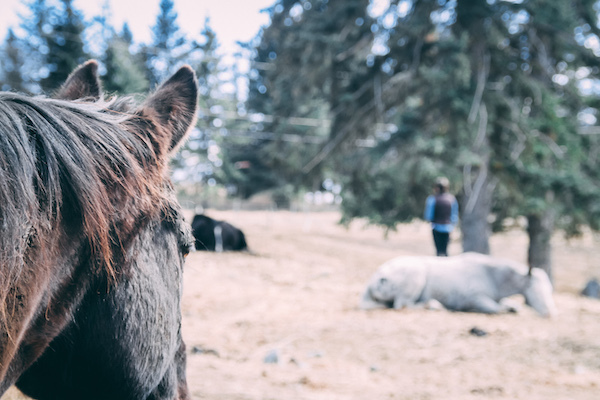 The horses become our mirrors and guides, giving us clear feedback which allows us to see where we hold back and creating a space to step into a more empowered and clear state of being. You can read more about the retreat here and register for a space. Limited spaces are available due to the nature of the retreat. Or if this speaks to you and you are wanting a more private immersion as part of your process, I hold private and custom retreats for women entrepreneurs that I love supporting when it is time for them to emerge more deeply and successfully in their vision and leadership. You can check that out here. Otherwise, if you simply needed to witness the energy of this post, I am glad to share it. Your Purpose is Bigger Than You Think It Is. My vision is so much bigger than I thought it was. I thought when I came here today that I had nothing to say or work through. I had no idea. Our session and our time together over the last few months has been about her stepping into holding the magnitude of her work, but today that vision got bigger. And as she left our retreat space, I told her, You wouldn’t be here if you weren’t ready for expansion and that is what you want. It is what I want, she said. We have an idea of ourselves that is filtered through our ego, our false self, and it likes to paint a picture or try to figure out how things are going to go. We cannot dictate to purpose what it is going to be. We can’t control it and we are not always going to be able to comprehend it. It is not our job to be the dictators of our visions. And we can’t trust our perception of what we think we are meant for. Three and a half years ago, a 1.2 million dollar, 80-acre property showed up in my inbox. My first thought was, there is no way. It’s too big, it’s too much, I can’t. Another voice said, if it is here, you can. To rewind a bit... The year this ranch showed up I made an intention to myself, to be open to the fullest capacity of what was available to me. I didn’t know what that was. I didn’t have a clear picture of it. I didn’t have a vision, but I had an intention and I had an affirmation and invitation to go bigger. And the manifestation of that invitation was this ranch. Many people around me said this to me. It’s too big; it’s too much. You can’t do it on your own, as a single young woman. It was a lot. But a deeper voice in me said, if it is here, it is because you are meant for it. I believe our purpose and our visions for our life have an energy of its own. If we can allow it to dictate to us, if we can be open to it, and let the energy of it guide us, great things can manifest. We don’t have the purity, the knowing, the intelligence that is greater than the energy of our purpose or the universe that supports us. When we try to control, we are limiting ourselves. I didn’t have any idea how I was going to pull off buying a million dollar property, or really continue to sustain it. I have a large overhead. There are many pieces of responsibility that I have to carry, and it is overwhelming a lot of the times to know how I am going to do that, without killing myself or feeling the burden of it. However, when I drop into the knowing that there is a deeper energy that guides us, that our purpose is found in the expansion of allowing ourselves to be open to what it is, I somehow pull it off. Your purpose is an energy. It is bigger, more expansive, more powerful than you realize, and probably, than you can wrap your head around. You don’t have to know what it is to be open to it. For many of us, we give power to the thoughts of smallness, all the reasons why we can’t do something---it’s not possible, the perfection of we lack the time, the resources, the ability to step into what is deeply calling to us. I didn’t have a million dollars in my bank when I purchased this property. I didn’t have the support when I stepped into this dream and said yes to it. I haven’t always had what I needed when something showed up in my world or I felt the intuition to move towards it. But when I took a step, and trusted the part of me that said this is for me, things shifted to allow it to happen. Sometimes we have this perception that we need to be on the need to know basis of how life is working for us. But the magic is in the trusting of where we are being led and guided by a deeper energy. Your purpose is that to you. It is a force to be reckoned with. It has its own space. It is powerful. and it is clear. You just have to get out of the way to allow it. Be open to the magnitude of what is in store for you even if you can’t figure out the why of it, or how. Just allow it. The voices that tell you not too, or it’s not safe, or you can’t are not speaking truths. Listen to the deeper voice and let purpose dictate what it wants to be for you. This share is deepening into an invitation, if it calls to you, to join me on a 10 month journey of awakening and creating through purpose. This journey is for women that are ready to claim the essence of their purpose more deeply in the world and finally move through the fear and doubts that keeps them stuck and small. I would love to invite you to join me in this 10 month program. We begin in March. Applications are now open and there are 5 spaces available. This container is for you. Our encouragement: if your intuition is speaking to you to explore, listen to that and apply. We are not led and nudged to places that don't belong or speak to us. Applying for a space does not obligate you to join me, however it does open up the conversation for you of what is possible and what is calling to you. If you are curious or feel nudged to step into journeying with the horses and myself, follow the link below to read more about this space and apply to join us. Take in this message and allow the medicine of it to add to your expansion. And if it lands for you or you know of someone who will resonate with the message, please share. Last night was the blood full moon, and the day before, I watched two of my horses play that I had never seen engage before. A message emerged that I wanted to speak and share with you today about our ability to dance with our shadows. We are human, and being human, part of the navigation of our world is learning how to be in relationship with all aspects of ourselves, embracing them as purely as we can embrace the good things. Perhaps, I am not unlike you. I have been a seeker of my own truth and potential for most of my life, and as someone who considers herself to be “spiritual”, I didn't give myself much room for making mistakes or tolerance for my own humanity. I lacked compassion for myself, in my flaws and mistakes. I made myself wrong for the things I didn’t know how to do or the suffering I put myself through. Horses have taught me much, but one of the most empowering lessons they taught me was about the acceptance of who I am at the core of me. To be neutral without judgement when I am looking at myself, and in this way, it has given me courage to lift back the veils to be witness of myself in new ways, and have the ability to see my humanity through a new lens. I believe that courage comes when we are able to witness ourselves without judgement, but with kindness. Dancing with our shadows and the parts of ourselves that we are not always comfortable with means that we are moving with them the same way we move with the parts of ourselves that we love. When we hold judgement on ourselves, when we are harsh with how we witness and hold ourselves in the world, we are not allowing ourselves the pathways to experiencing our true nature or moving beyond where we feel stuck in our own way. Our shadows, our fears are part of us. I remember, years ago, when I was first getting into the space of personal growth, I had this belief that I had to get rid of all that, death to the ego! And so when I caught myself there I would be harsh and judgmental and fearful of being in that space. I realized years later it is not realistic for me to “rid” myself of these parts of myself. Also, they have wisdom and purpose as well. So I changed my relationship to I will embrace these parts of myself. I will dance with them and witness them the same way I do the other pieces of myself. I will tell you why this is an important message. When we want to shift beyond our own place of doubt, fear, wounds, the judgement of them is not healing them, It is creating more energy around them so we get stuck. If you want to shift something within you, you have to embrace that it is there. Be gentle and curious about what it is offering you and how you can your perspective shift around it. I am human and I always will be. I have fears and doubts. I have places of wounding and shadows like everyone else. They travel with me. Sometimes they create space where I can’t move, and other times, they bring me into deeper alignment with myself. But I no longer hate them, or resent them, or pretend they are not there, or ignore their presence within me. This weekend, as I watched two of my horses dancing together, Jet and Indra, who have not done that before... Jet can be a bit of a bully with other horses. Sometimes the other geldings won’t play with him because they don’t trust his intention, but there was Indra dancing and playing with him. And I got that he knows in his wisdom how to be with that energy. Jet has purpose too in his assertive and sometimes “Aggressive” energy. He has taught me the lesson of not judging the things I am uncomfortable with, but instead seeing the medicine in it. He is learning too, as we are. He is also evolving, and as I watched these two horses play and run and kick up their heels, I witnessed something in that. I can change the relationship with the parts of me that I don’t always like if I learn how to dance with them in new ways, and then, instead of them feeling like they are pricking me or part of my flawed nature I can instead integrate them into new places within myself. If this resonates with you..
Look to where you are pushing away parts of you, uncomfortable with your flaws, judging yourself for your mistakes and if you could embrace them instead, as part of you, dance with them in a place of compassion and gentleness, and see how things soften around them. We create space when we do this, and the unconditional embracing of who we are becomes a powerful medicine that we give to ourselves, and also to others, and to our path. An invitation to you to dance with your dark parts in a different way, hold them in a different light and witness what happens when you do. P.S. A reminder for my women entrepreneurs: On Wednesday, I am holding space for a free virtual retreat to speak about the journey of creating success around our gifts and empowering our vision of creating a practice around our purpose. If you are stuck, or feeling overwhelmed in any pieces of growing or starting your business of purpose, come join me. And for those that are moved to join us in the space of horse medicine, our retreats are now open for enrollment. 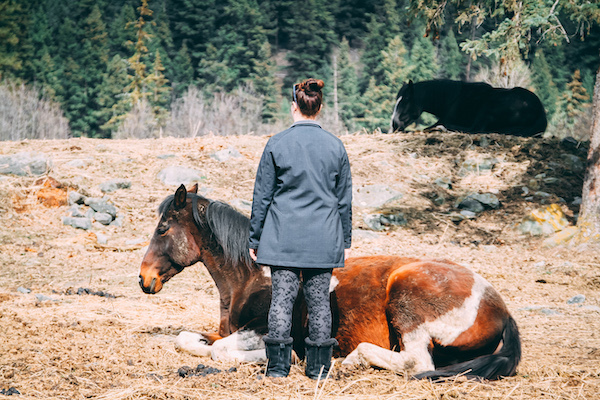 If you are seeking a space of retreat for yourself, to grow into clarity of purpose, moving past fears and being held in the deep space of horse wisdom, we would love welcome you to the retreat this year. Check out our retreat page here.